Are y’all ready for some super exciting news? We (finally) were able to make another version of our fabulous 2015-2016 Planner for you! Many of you requested it come in a smaller size – so after much trial and error on our part to get it sized down and easily printable, I’m thrilled to share it with you today! 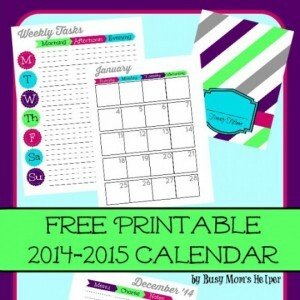 So without further ado – our Free Printable 2016 Planner Half-Sized Version! A few VERY IMPORTANT things about this – PAY ATTENTION!!! It is designed so it can be printed BACK AND FRONT, saving you paper. However, to set it up like this it looks VERY out of order – because it is for normal printing. BUT – when you print it back to front onto 8.5×11 size paper, it will be facing exactly how it should for you to bind it down the middle into the perfect planner/booklet! We found that on home printers, there are margins that come up, no matter what we tried to change. So I highly recommend taking it to a professional printer like Staples or somewhere and having them print it without margins. If you DO want to print it at home, be sure to set it to FIT instead of ACTUAL SIZE/100% or some will get cut off due to margin stuff. Then just trim off the white around the edges and staple/bind as desired! I know this may not be the EXACT size you were wanting, specifically. I received MANY requests for all sorts of custom, smaller sized – I’m very very sorry, but as much as I’d love to make everyone happy, it’s just not realistic. This one version took several days of work and frustration – and I’m giving it to you for FREE. So please forgive if it’s not 100% perfect. Download Here – AFTER reading the above IMPORTANT Notes, please! 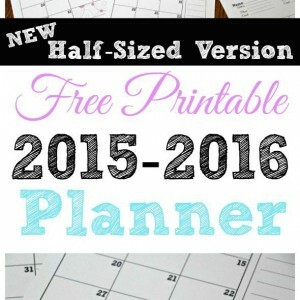 Still just want the full 8.5×11 size planner? Grab it HERE! 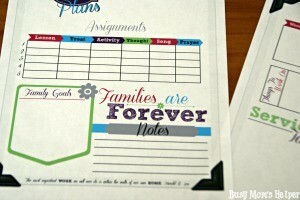 Other printables to help you get organized! I’m in major shock that later this week we’ll be writing 2015 on everything. Where the heck did this year go? It was full of fun and memories, challenges and obstacles, great achievements and growth. Despite how time seemed to fly by, this year was absolutely wonderful! 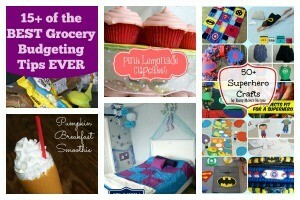 As we wrap up December, I wanted to share the Best of Busy Mom’s Helper 2014! Below are the Top 10 Posts from 2014, what all you amazing readers chose as the most popular! Busy Mom’s Helper has grown so much over the past year, and opened up a lot of doors for my family and I. I wanted to say THANK YOU for all of your support this past year, and hope you’ll stick around for the many fabulous things to come this next year! These are all some of my own favorites, too, so it’s good to know that we share our likes! I have a TON of exciting plans and fun things coming up, so I hope y’all stay tuned for more awesome ideas, recipes, home projects, crafts and more during 2015! Let’s kick off the year with a BANG and end it with a WOOT WOOT! 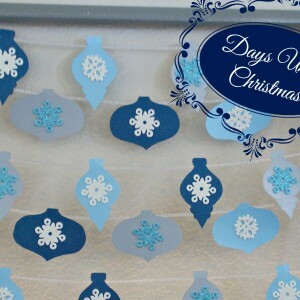 I know it’s still Thanksgiving time, but thought it would be wise to share my DIY Days until Christmas Countdown beforehand, so there’s plenty of time to pull it together before the 1st hits us….only a few days more! I’ve seen those hanging countdowns plenty, and thought they were absolutely adorable. 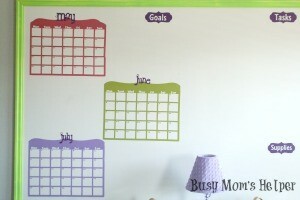 I’m on a budget, though, so wanted the cutest calendar for the least damage to my bank account. This was so EASY and cost me less than $18! Yup, that’s a winner right there, in my opinion! First, decide on your shape. Trace onto your paper pieces and cut out. Put stickers, if desired, onto your shapes to give them a little ‘somethin somethin’. Paint your frame, if desired. Figure out your exact desired layout, making sure it fits the way you want inside your frame. 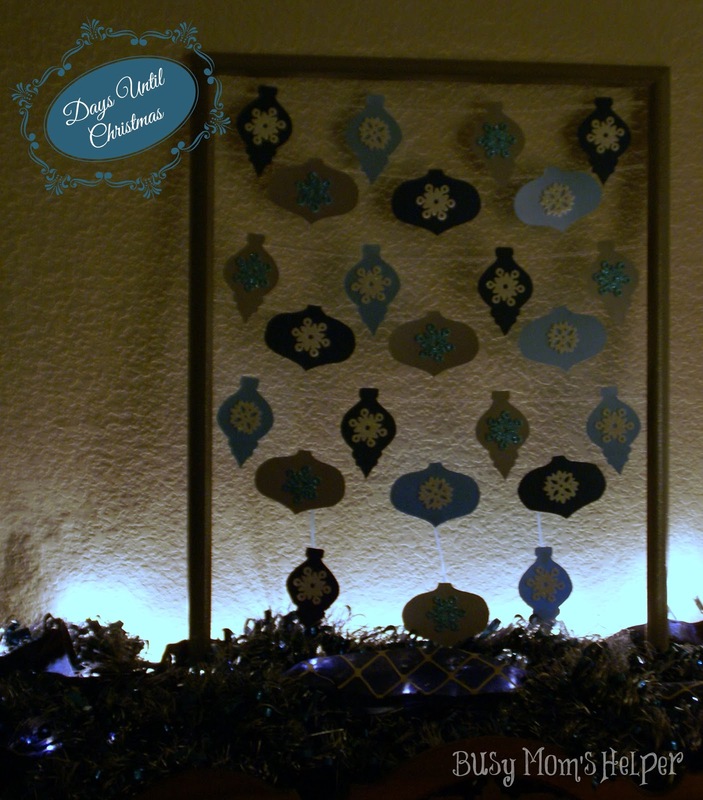 Use ribbon to tape rows, as laid out, onto the frame back. Attach your shapes with tape pieces so they’re secure and don’t fall off. For fun, I wrote something for us to do during December on the back of each ornament. So each day when we do the countdown, we can see what activity we’ll be doing that day! Decorate, light it up, and ENJOY!!!! What’s your favorite Christmas Countdown?